So as a Sailor I have experienced some times where sunset and moonrise are very close together (this happens when it's full moon) which is particularly beautiful. I assumed that this was always the case but looking more closely at time difference between sunset and moonrise they can change quite dramatically. As you can see there is some degree of variation, can someone explain why this happens and how I can find out where and when they are closest together? Technically, the Moon is Full at a specific time. Therefore you need to check the time of sunset/moonrise OR sunrise/moonset that is closest to the time of Full Moon. Then you can more accurately compare the variation. Here is the list for 2019 created using the U.S. Naval Observatory website. The difference is much smaller than your original list. If the moonrise/set is not the same time as the exact Full Moon, then moonrise/set occurs earlier or later than the sunset/rise. Because the Moon passes above and below the ecliptic (the path of the Sun in the sky), the Full Moon is rarely directly opposite from the Sun. Therefore, it can rise earlier or later than the Sun even when exactly "Full". Even if the Full Moon were exactly opposite from the Sun (180 degrees apart, and in a total lunar eclipse), there would still be a difference between the time of sunset/moonrise. Those times are when the limb of the sun/moon is visible, and the limbs are closer together than 180 degrees apart. Also, atmospheric refraction shrinks the separation a small amount. Where and when are they closest? This is more involved but can be reasoned using the following figure. The Sun is in the direction of 1, so the ring of sunset-sunrise is the circle A-A. The Full Moon is in the direction of 2, so the ring of moonrise-moonset is the circle B-B. Where these two circles cross at C is where the sunset and moonrise (or sunrise and moonset) occur at the same time. The highlighted area is where the Moon and Sun are both above the horizon at the same time. Note that this figure is highly exaggerated for illustrative purposes. The moon rises about 50 minutes later on consecutive days. In addition, the sunset time might be changing by a couple of minutes a day as well. Since sunset only happens once a day, then we'd expect the rise after a full moon to be anywhere in that ~50 minute period late. On average then, I'd expect the closest sunset/moonrise of a month to usually be a quarter of that range (cut in half because closest could be before or after, and another half for variation) or about 15 minutes. There are a lot of sites with accurate sunset/moonrise times, but I don't know of any that directly give the delta between them. Could probably create one with some python scripts, but not something I've done. Going out on a limb a bit here -- depending on the month, the compass location where the sun sets varies as well as the length of time the sun is above the horizon (note also there are different definitions of "sunrise" - visible, half up, etc). The moon's compass location varies with a different cycle because the moon's orbit is not perfectly over the equator. Combine those two variables, keeping in mind that a "perfect" full moon happens when the sun and the moon are exactly $\pi$ radians apart from our point of view, and it would appear quite reasonable to have significant variation in their relative rise/set times. The reason for this is quite simple. While we orbit the sun, the moon is orbiting us. Look at the direction of the sunlight (this will show where the Sun is), then look at the position of the Moon. Let us take the Full Moon as an example. 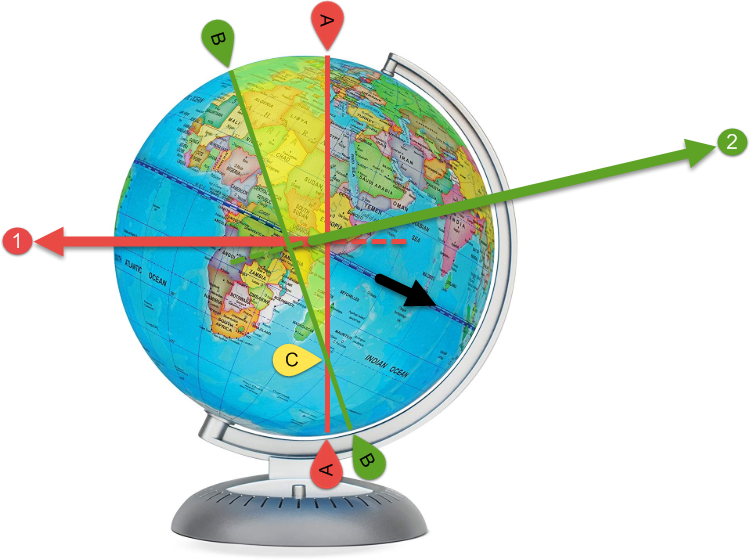 Imagine, in this 2D image, the Earth is rotating anti-clockwise. As the Sun is on one side, the moon is on the other. So Sunset and Moonrise will occur at close to the same time. Now let us look at the first quarter. At sunset, the moon is going to be almost directly overhead, which means moonrise occurred hours previously. Using a 2D visual representation makes it easy to visualise. Of course, it is not always so black and white, as the moons orbit is not a perfect circle same as ours is not perfect around the sun (hence different rise times throughout the year during the same phases), then there is axial tilt etc, etc. But this will give you a pretty good idea. The closer to the full moon it is, the closer Moonrise and Sunset will be. Any pictures showing difference in moon between southern and northern observers?